St Mary’s Well / St Melyd’s Well, I was tempted to say “so good they named it twice”, but I think that’s probably pushing things a little to far. It took three visits to finally pin it down, and even when I did it didn’t turn out to be all that exciting. St Mary’s Well lies on the boundary between Meliden (Gallt Melyd) and Gwaenysgor. 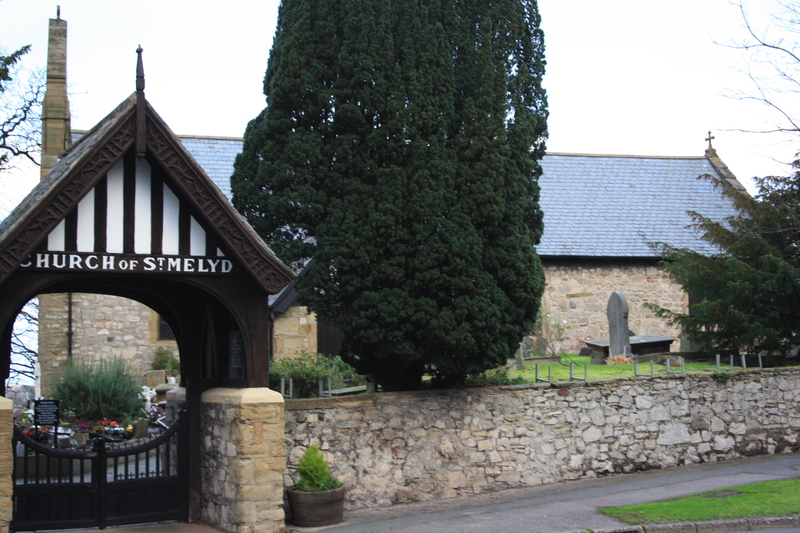 The church at Meliden is dedicated to St Melyd and that at Gwaenysgor to St Mary Magdalene. The well has carried both the names of St Mary and St Melyd, though as we have found before St Mary’s Well, Ffynnon Fairm often appears to be a generic name for Holy Wells, and the St Melyd dedication probably predates that to St Mary. 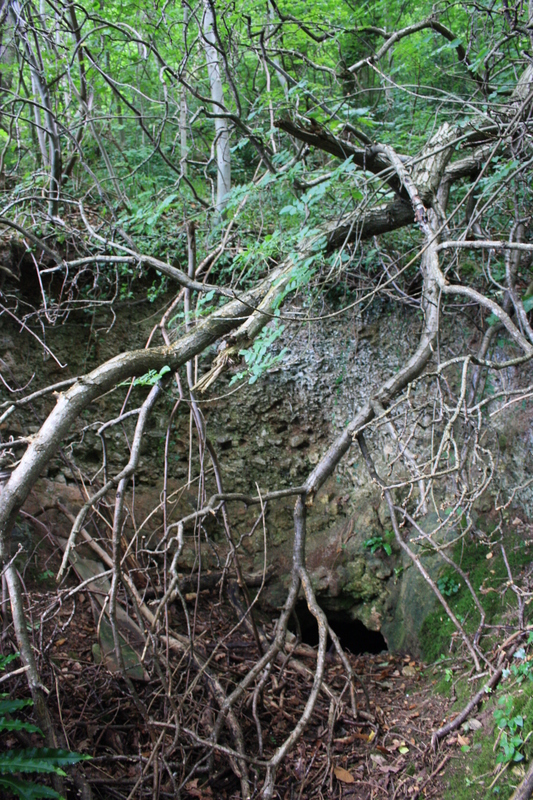 With no more recent description than that, we had little to go on in our search for St Mary’s Well. Using the grid reference supplied by the Coflein database, although lacking a GPS to check the precise location on the ground; and the fact that the large scale OS maps mark a well in approximately that location, we ventured out. 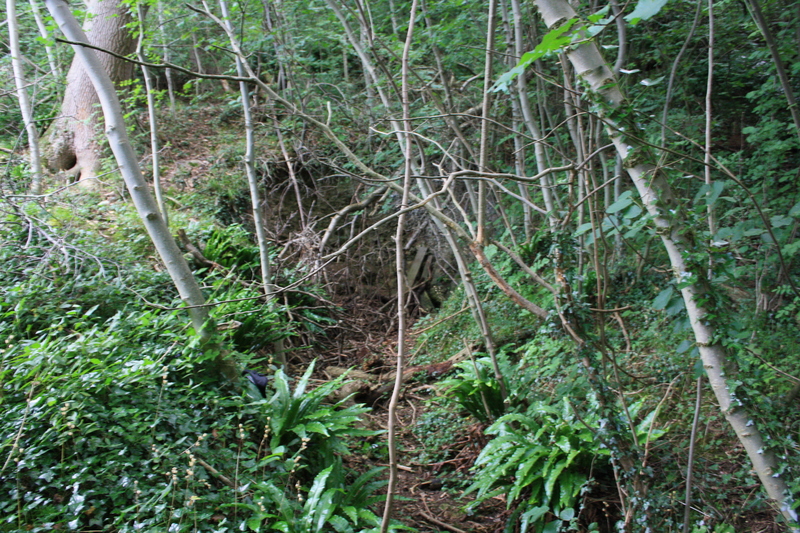 The well is hidden in Coed yr Esgob (The Bishops Wood), which occupies a steep hillside overlooking Prestatyn. The location marked on the OS Maps is best accessed from the end of Bishopswood Road, it lies in an area which contains the remains of eighteenth century lead mine workings, one of which is well preserved and may be visited. The first attempts turned into a wild goose chase involving precarious scrambling about on the sides of s steep hillside risking life and very probably limb. Given that no recent descriptions were available any slightly hollow feature became a candidate. In response to my original post on the topic, Janet Bord and Tristan Gray Hulse did a little exploring and passed on information from a local resident, which finally led us to the correct location. Even this bears little resemblance to the description of the Royal Commission, and it took two visits to be convinced. A short, but steeply climbing path, leads directly from the roadside, accessed by a few steps. It is beside a large, forbidding looking house, which appears to be gradually spreading up the hillside with stone and concrete. The name of the house? St Mary’s – now that should have been a give away. The well site is at the top of the track, at the foot of a small rocky outcrop, in a sheltered hollow in the hillside. It is well hidden behind fallen branches and trees. No signs of water there on any visit I have made, and no evidence to support the Royal Commission conjecture that it sometimes does. Although the inside of the well seems clear of debris as though it is possible washed clear at times. The church of St Melyd is down the road towards Dyserth in Meliden itself. The church was firmly locked and there were no signs of how to gain admittance. A large sign dominated the lych gate proclaimed Regulation 17 – detailing what could and couldn’t be placed at gravesides. The fact that this was regulation 17 prompted the question of how many more regulations there were. The church appears to have been built on a typical circular site, which has since been extended. The church too appears to have been extended several times, and the majority of the building is Victorian and of little interest. 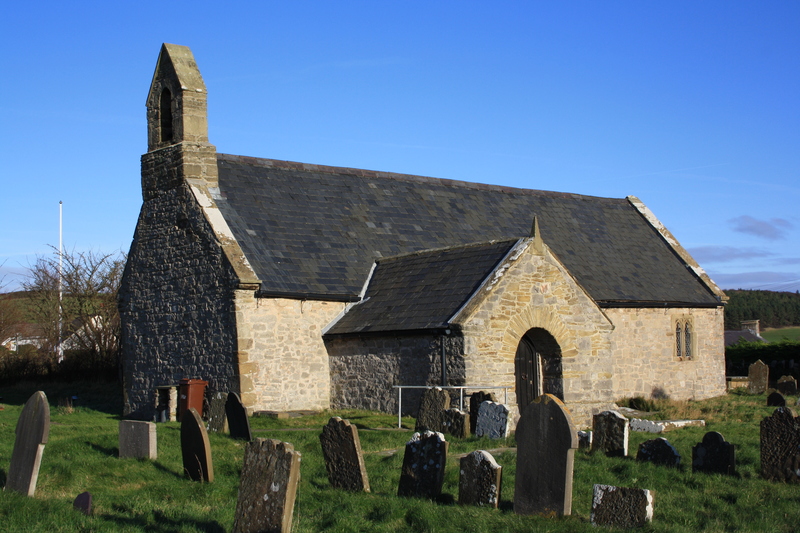 The church of St Mary Magdalene, on the other side of the hill at Gwaenysgor, is a smaller and much older building. This too was locked on the day we visited. Please note that since this post was written I have been informed that both churches will normally be open to visitors during the day. This item was substantially re-written in March 2014. There is indeed considerable confusion over St Mary’s and St Melyd’s Wells, but the evidence suggests these are two separate wells. St Mary’s (Ffynnon Fair) is a dry well on the main road almost in Dyserth. Apparently it was in the old tourist guide to Prestatyn as being on the route to Dyserth waterfall. Lhuyd referred to St Melyd’s Well (as Ffynnon Felid) in his Parochialia (late 17th century) but didn’t give a specific location, unfortunately. The church guidebook says, ‘There also used to be a small cave or grotto known as St Mary’s Well in Bishop’s Wood on the hillside above Meliden.’ This was probably St Melyd’s Well, and I was shown this well some years ago. It is actually on the path which goes up diagonally through the wood from the southern end of Bishopswood Road; there is a small ‘cave or grotto’ and also some stonework which could be the remains of a bathing tank. I did walk up that path you mention on the same day and found a cave and tank, but this is fronted by information panels presenting it as old lead mine workings. Whether this is the site you were shown, or there is yet another site further up I’m not sure. Interesting! I haven’t actually been to the well (if it is) for a while, so must have another look – and see if the identification of the site as mine workings is convincing. I know the area is riddled with mines, so it’s not impossible, but the people who identified the well as mine workings may not know anything about holy wells. I will keep digging, and will update you if I find out anything more. Isre a confusion here between St Marys Well and the Fish Cave? St Marys well is shown on old maps as being to the left and below the Fish cave. Is the fish cave the mine working that you come to on the footpath at the end of Bishopswood Road?. If so them that isn’t what I am calling St Marys Well, although if so then I agree with you that it seems as though that is what was erroneously being called the well in the discussion above. The site I am considering is on the hillside on the left, around 100 yards before the end of the road and up behind a large house called St Marys. I know the site in this post from exploring as a boy in the early-late 1980s. This is not the Fish Cave. We had no name for it. There used to be water here. I recall wading through it chest deep (with for some reason a cassette tape in my trouser pocket, which became damaged) in order to explore the rear of it. Perhaps that helps. No this is not the Fish Cave, this is a couple of hundred yards before you reach the Fish Cave. Are you saying that you used to go down inside this location in the 1980s? it must have been a tight squeeze to get inside, Interesting that it was so full of water, did it always contain water or just during rainy periods? Yes, that’s right, we would go down inside it. I couldn’t comment on whether it always contained water or not. I do need to make sure that it is the correct one as there is another very similar in Bishops Wood similarly distant from the road and the Fish Cave – but at the other end. So, when you say “before you reach the Fish Cave” and “the end of Bishopswood Road” – in which direction are you traveling (is the coast to your right hand or left?)? Which end of the road? Ah, in which case, my ramblings may have misled you. 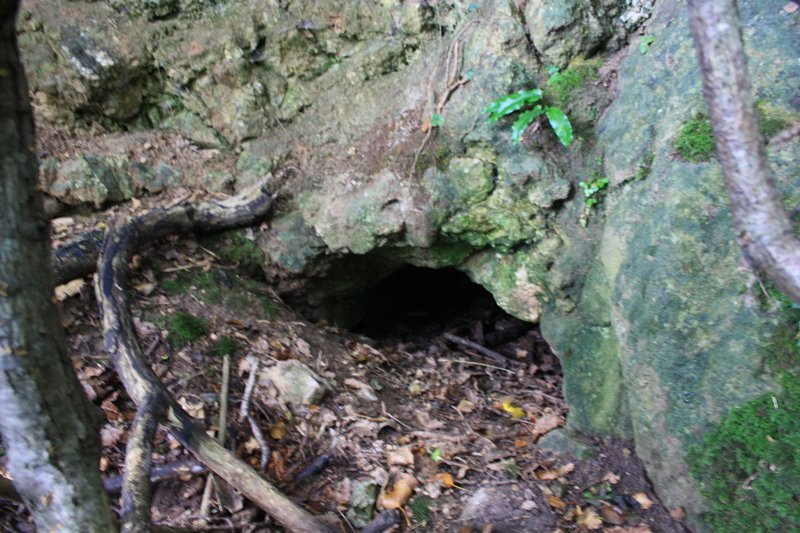 The rift-like entrance to the “hole” is remarkably similar to one approached from the other end of the wood. Which is described correctly at the link I post underneath, and is it now seems inaccurately called St Mary’s Well by that author. This one at the link is where I played when younger. The grid ref is correct. Glad it is of interest. I do recall a more serious vertical well-like shaft on the golf course in that area. It was fenced off. It is on the opposite side of the old railway from Bishops Wood. May be of interest. As a teenager I once cut branches from the yew tree in your photo to make a bow. Just to let you know, that for the past couple of years St. Melyd’s Church Meliden has been open daily from about 9.00 a.m. to 4.00 p.m. Monday to Saturday, and is open on Sundays for services. St. Mary Magdalene’s Church Gwaenysgor is open on the same basis. Visitors are very welcome, and there is information available to help your visit. Please do call in.